Was having some smoked salmon, smoked trout and bagels, along with some other great food on Christmas morning. But, can’t enjoy cream cheese because of lactose intolerance. Was in the cheese section at Whole Foods on Christmas Eve seeing if I could find any spreadable goat or sheep’s milk cheese and didn’t see any so asked if they had suggestions. I was taken to the other side of that area (had to walk by the olive bar and not grab anything) and handed a tub of (essentially) goat cream cheese, by Merci Chef! Score! When it was used the next morning on the bagels…wow. So good. It was like whipped cream cheese. Soft, fluffy, smooth and a very nice delicate taste. Will totally remember this for the future. Another restaurant tested…received a recommendation to check out Mykonos Grill in Rockville, MD from a good friend. I had driven by it countless times (when going to Bed, Bath & Beyond) and was glad to hear it was worth checking out. Got there sort of early and the hostess asked if I had a reservation. No, but was able to get a table for my friend and me. Within 30 minutes that place was packed! Wow, this place i obviously popular. My friend and I split a bottle of Greek Red. Can’t remember the name of it (no correlation to the amount we drank). They come out with their warm bread and the super seasoned lemony olive oil — so good! We ordered some Melitzanosalata right off the bat; a smoked mousse (no dairy) eggplant froth, olive oil, lemon juice and herbs. Similar to baba ghannoush. Based on their specials that night, we opted to split their roasted Branzino, a whole Mediterranean bass, white moist tender flakes, delicate flavor. It was so nice. The servers were so nice, all the service was great, the place was packed and the dinner just melted in your mouth. I can’t believe I had driven by this place so many times. Glad I finally went. Recently dined at a sushi restaurant in Chinatown, DC, Momoji to be exact. You walk in and they have a very small bright downstairs area or you can ask to go upstairs to a more quaint (sort 0f) Asian restaurant. We were there right at the end of happy hour and there were some great prices on the menu that we were able to snag with 5 minutes left. Note: you can only order 1 drink/per person at a time. Even if you were the only person sitting at the table, you can only order one drink at a time. You can’t stockpile pre-end of happy hour. Really? Cocktail-wise we opted for some asian beer and a pear drink. That thing was pretty good. They had some seasonal food on the menu and a Christmas roll came to the table. I ordered the squid salad…very good (sorry for the bad light in the picture). For main indulgence we got the Chirashi Dinner of 13 pcs sashimi (chef’s choice) over seasoned rice. So good with several varieties of fish. Every piece of that got finished! Overall good food. Service was slow, happy hour had good prices. Worth checking out if you’re in the area. After one runs the MCRRC Jingle Bell Jog in shorts & tshirt, because of 60-degree weather in mid-December, why not continue the great day? 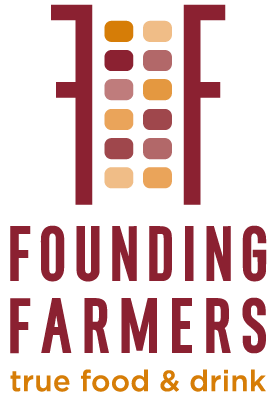 My friend and I visited Founding Farmers in Potomac for brunch. I had heard mixed reviews on the restaurant, based on the locations, so was excited to give it a try. Knowing the popularity of this place I made a reservation a few days ahead of time. So glad I did. It was packed! When we arrived the #1 priority was coffee. Good stuff. After skimming the menu I opted for a nice basic breakfast; you get to pick eggs, meat, bread, veggie. I went for scrambled eggs, turkey sausage, wheat bread and a green salad. Very nicely cooked eggs. The salad was great. There were grapes tomatoes, avocados and almonds in there with a nice light dressing. The price was under $10. Complaints: they wondered why we wanted jam for our bread and brought us maybe a single serving for the two of us. It frustrated them to bring more. Then we got the check. It was just over $20 — my friend ordered the sausage, mushroom & spinach pan scramble. We were floored (in a good way)! Then we noticed they didn’t charge us for the coffee (not a major cost to the restaurant). After we gave the waitress the credit card to run, she came back and let us know she forgot to charge us the $3+ each for the coffee and would now need to include it. Seemed like something unnecessary based on the fact that it was her fault and it was only coffee. Not worth the fight. It’s definitely the time of year to try new places. A recent restaurant visit took me to Cava Mezze in Rockville, MD. This is the real restaurant vs the fast-food version, which is Cava Grill. The restaurant offers a wide selection of shared plates (like tapas) and good drink menu. 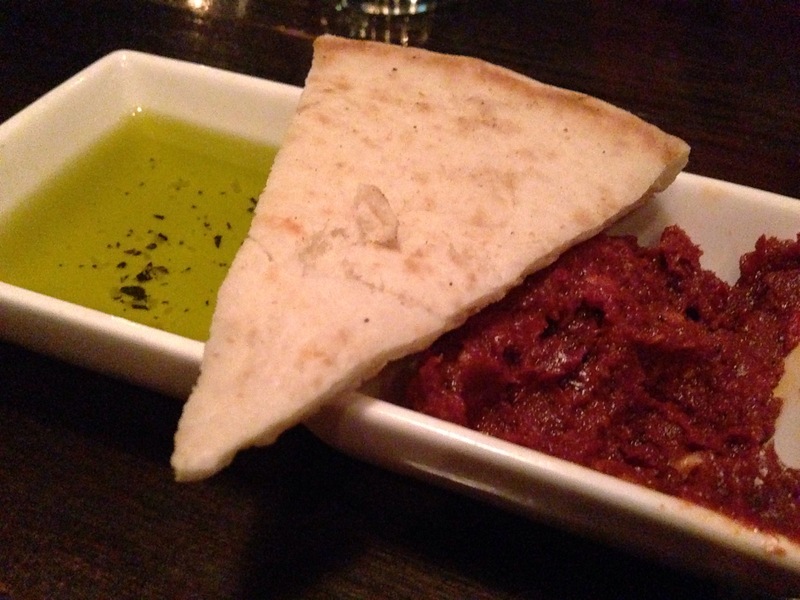 They start you off with super warm pita bread and nice olive oil and harissa. After looking over the wine list, we opted for a house wine, Black of Kalavryta. Wow! It’s labeled as a dry Greek red. Got a slight hint of leather and some great dark cherries and strawberries. Jumping ahead, we asked if we could buy bottles to take home, and it was not possible. Going to do some research as to who makes this stuff. The waitress suggested 2-3 tapas per person, so we ordered 2 each to start and sort of share. Taramosalata — salmon roe, lemon, breadcrumbs. First I had to look up what this really is. Per Wikipedia: Taramasalata is a Greek and Turkish meze made from tarama, the salted and cured roe of the cod, carp, or grey mullet mixed. Let me tell you: tasty! Roasted Cauliflower — cumin, olive oil, fried capers, lemon yogurt. Such a nice taste from the roasting and apparently the yogurt was amazing!! Octopus — grilled octopus, black beluga lentils, green harissa. OMG, enough said. Lamb Chops — two baby chops, crisped potatoes, extra virgin olive oil. Perfectly done. This was a phenomenal dinner. The only thing bad is that it had taken me so long to get there. It is a small place so when you check it out, make a reservation. Had a party to attend the other night and wanted to take something a little different. After flipping through a recent issue of Food & Wine came across a good sounding recipe — Popcorn with Sesame-Glazed Pistachios. All flavors sounded perfect so to the kitchen I went. -Preheat the oven to 350° and line a baking sheet with parchment paper. In a large saucepan, combine the vegetable oil and popcorn, cover and cook over moderate heat until the corn starts to pop. Cook, shaking the pan until the popping stops, 3 to 5 minutes. Transfer the popcorn to a large bowl and season lightly with salt. -Wipe out the saucepan. Add the olive oil, sugar, sesame seeds, soy sauce, garlic powder and 2 teaspoons of salt and cook over moderate heat, stirring, until the sugar dissolves, about 3 minutes. Add the pistachios and cook, stirring, for 1 minute. Scrape the pistachios onto the prepared baking sheet and bake for about 10 minutes, until bubbling. Scrape the pistachio mixture into the popcorn and toss well. Let cool before serving. The mix can be made early in the day and stored in an airtight container at room temperature. Prep-wise, not as easy as I expected. The pistachios did not get crusted/coated. I got clumps of sesame seeds with soy sauce and a glaze over the pistachios. But, overall, the taste was nonetheless delicious. So, was glad I tried the recipe. Would totally make it again.